Two Detached and Four Semi-Detached contemporary freehold homes in exclusive Baby Point. Rear lane common element access to private garage or pad parking. Nearly 2,500 square feet of modern living space; finished basement included. Four Bedrooms • Three Bathrooms plus Powder Room. Below grade construction in concrete; above grade in wood frame. 8” concrete block party walls for superior sound attenuation and fire protection in semi-detached homes. Exterior clad in a combination of materials including brick and concrete composite panels. Each home includes a rear yard with privacy fencing. Flat roof system with skylight. Energy efficient, low-E argon filled windows. Triple glazed facing Jane & Raymond St. providing additional sound proofing. Front entrance and Master Retreat balcony feature black vinyl railings with tempered glass panels. Covered front porch with an elegant 8’ high door and three-point lock system for added security. Rear lane garages; walls finished and primed for painting. Ventilation ducts professionally cleaned prior to occupancy. Interior Design by Award Winning Jill Greaves Design Inc. Premium contemporary design and finishes, combined with hints of traditional elements. 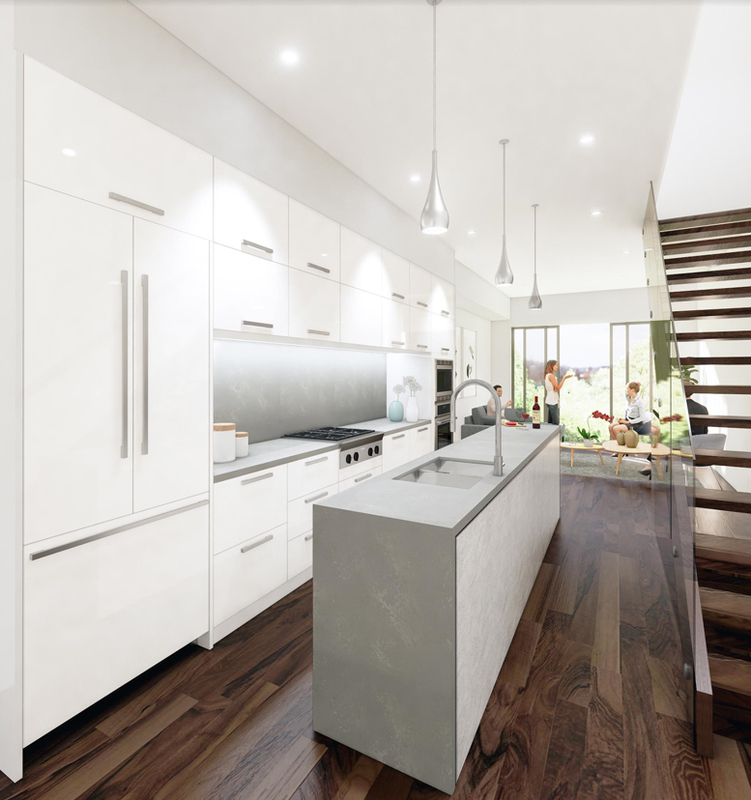 Spacious open concept ground floor plan incorporating live, dine and cook in a single space. Abundant natural light with large windows and 8’ high double sliding glass doors at rear of first floor. Private Master Retreat includes: large balcony from Bedroom, Spa, Wet Bar, Work Space and generous Storage areas. Finished lower level includes: Family Room, Bedroom and 3-piece bath. Prefinished engineered wood floor on first, second and third floors. Marble or slate floor tiles in Foyer and Kitchen. Berber carpeting on lower level. Solid core painted interior doors with contemporary lever style hardware and barn-door tracks, as per plan. Custom designed contemporary door casings and baseboards. Pre-wired for high-speed internet, television and telephone (Cat5 & RG6) in living room, bedrooms, den and family room. Pre-wired using for using Cat5 & RG6, including wall mounted television in living room and master bedroom. Remote control garage door opener plus, rough-in for electric car charging station. Recessed LED lighting in foyer, living and dining rooms, hallways, den, family room and bathrooms. Contemporary ceiling fixtures in covered porch, above kitchen island, powder room, laundry room, bedrooms 1, 2 and 3. Shower light in all bathrooms. Closet door switch lighting in bedrooms 1, 2 and 3. Decora switches and receptacles throughout. Energy efficient, zoned controlled, forced air gas furnace and central air conditioning. Gas hot water tank, rental by owner. Exterior electrical outlet at the front and rear. Tarion Warranty Corporation New Home Warranty Protection. Custom designed, European inspired contemporary kitchen with flat panel cabinet doors. High-quality hardware and soft-close drawers. Quartz countertops including waterfall on island and matching backsplash. Double stainless steel undermount sink with goose neck pull out faucet. Stainless Steel gas range and built-in microwave. Integrated counter depth refrigerator and dishwasher with panels to match cabinetry. Integrated exhaust hood fan clad in matching cabinetry. Spacious and custom designed to create a luxurious private retreat. Large-format marble or granite floor and wall tiles. Custom designed wall mounted vanity with two undermount sinks and quartz countertop. Two 36” wall mounted double door storage cabinets in Lots 2 through 6. Contemporary design freestanding tub faucet and hand shower. Frameless glass shower enclosure with rain shower head and handheld shower. Frameless frosted glass enclosed water closet with 1 piece white toilet. Custom designed cabinet with drawers. Contemporary goose neck single lever faucet. 3.3 cubic ft. compact refrigerator. Wall mounted contemporary Italian designed vanity with moulded white washbasin. Mirror and contemporary wall sconce above sink. Soaker tub with contemporary hardware and surrounded by 4” x 16” white subway tile. Frameless glass shower enclosure with rain shower head and handheld shower; combined with 4” x 16” white subway tile surround. Marble or granite floor tile. Separate laundry room on second floor with full sized front load washer and dryer. Stainless steel sink, laminate countertop with millwork above & below for storage. Thermador, 36” built in fridge with french doors and bottom freezer. Thermador, Professional Series 30″ NG Standard-Depth Freestanding Range. Whirlpool 7.4 cu. ft. Electric Dryer with Advanced Moisture Sensing. Floating double-stringer stairs on first floor. 42” high glass panel walls and chrome accents. 30” gas stove top with built-in oven and microwave. Prefinished ¾” Hardwood Floors on Main, 2nd, 3rd floors. Heated floor in MASTER RETREAT spa. Air-Jet Tub MASTER RETREAT spa. Rough-in for gas fireplace in Living area. * Finishes and colour options are from builder’s samples only. The builder has the right to substitute materials from various suppliers of equal or better value. Ceiling heights exclude mechanical bulkheads where necessary. Specifications, terms and conditions may be subject to change without notice. E. & O. E.